It had been awhile since I last visited with my favorite World War II British spy, Maggie Hope. 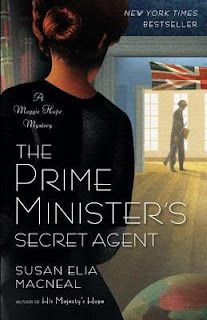 I had not planned to dive into The Prime Minister’s Secret Agent when I did, but I needed a new book to start, and it was the one that caught my attention. This is the 4th book in the Maggie Hope series by Susan Elia MacNeal. Maggie got her start as one of many secretaries for Prime Minister Winston Churchill. Having grown up in America, raised by an aunt, Maggie feels more at home in England, the home country of her father. Having proven to be quite resourceful and observant when she breaks a German code involving a devious plot, Maggie earned her way up the chain into Secret Agent status. Now, however, after experiencing the war first hand, Maggie is teaching future spies in Scotland, trying to push down the memories of the recent past. While each of the books in the series can be read alone, I highly recommend reading them in order. Each one builds on the other, and details about Maggie’s life are revealed along the way that play a major role in each of the novels. While normally I try to avoid giving away too much in past books, I am going to risk it here. If you plan to read the series, starting with book one, you might want to stop reading now. Much of the first part of the book is centered on Maggie as she struggles with Post Traumatic Stress. She’s hardened herself, numbing herself to much of what goes around her. She contemplates the worth of continuing to live. She is in a very dark place. And really, it is no wonder given all she has experienced over the last few years. Against her own desires, Maggie is ordered by her superior to visit her friend and former roommate who is performing in Edinburgh. There is nothing like murder to draw someone out of their funk, and it does just that for Maggie when she witnesses the death of a dancer on stage. Maggie puts all of her energy into finding out who was behind the poisoning, which may now be inadvertently killing her friend. The novel is divided into three different threads. There is Maggie’s plot line, of course. There is Clara, the Nazi spy (and Maggie’s mother) who is facing death in a short amount of time unless she opens up about what she knows. And then the countdown to December 7, 1942, when the United States is finally drawn into World War II. The Japanese are planning their attack on Pearl Harbor, an attack that might not have been a big surprise if red tape, misogyny and political and branch rivalries hadn’t gotten in the way. It was one of those tense story lines in which I know what will happen, and yet I was practically biting my nails in suspense just the same. Big Spoiler Section (highlight to read): I found it particularly interesting that over the course of the novel, Maggie never gave in to see her mother, even with her mother promising to reveal Nazi secrets only to Maggie. I imagine a face off is coming, but I hold Maggie in high esteem for putting her mother off after everything. Clara doesn’t deserve the time of day. Of course, it doesn’t help that the reader knows Clara doesn’t want to see her daughter due to guilt or devotion. It is hard to feel sympathy for such a manipulative and devious woman. I am so glad I dove into The Prime Minister’s Secret Agent when I did. I enjoyed every minute of my visit with Maggie Hope, and look forward to visiting again soon. To learn more about Susan Elia MacNeal and her books, please visit the author's website. My mother loves this series. Kay - It's easy to get distracted by other good books, I know. I hadn't even realized I was so behind on the series! I read the first one in this series, but didn't continue. Glad you enjoyed it, Wendy! I skipped your spoilers because although I'm behind on this series I just wanted to make sure :) So glad it still continues to be suspenseful and a recommended read! This sounds good! I read the spoilers and it makes me even more curious! Will definitely check if my library has this! I really enjoyed a later book in the series and keep meaning to read the earlier books. This does sound like quite the compelling read and I like the info you shared in the spoiler. Sounds like a great read!